It has been reported that some RQH rounds conducted have been run contrary to the rules. The Agility Committee has also failed to receive results from some clubs in the prescribed time making it difficult to keep the cumulative scores updated prior to the next round. Trial Secretaries should ensure when contracting judges to officiate at RQH's that they are aware of the rules of these events. This is particularly important when contracting interstate Agility Judges. The following information should be sent to any interstate Agility Judge who is contracted by the club to officiate at an RQH event. the Jumping Dog of the Year will continue to be designed as a twenty obstacle course. The course set is to be of a standard equivalent to that of the Open Class consequently, it will be mandatory to include the Weaving Poles in a Jumping RQH course. The Regional Qualifying Heats in both Agility and Jumping will be differentiated from a normal Open Course in that there will be no Distance Handling Challenge in the course. 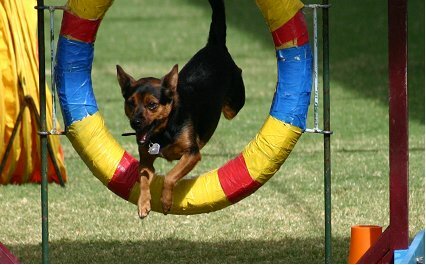 The courses for both Agility and Jumping will be judged according to the ANKC Rules for Agility. Thus, in both RQH events (Agility and Jumping), wrong course will incur a disqualification. The latest version of the RQH rules in its entirety on this web site and Clubs should ensure that these rules are adhered to. Then also submit an unmarked final catalogue and the original RQH Judge’s Score Sheets.